Have you ever watched one of the BBC’s groundbreaking wildlife documentaries and thought “ How did he get that shot?! ” – well now you can find out the incredible stories behind the images in Doug Allan’s book. 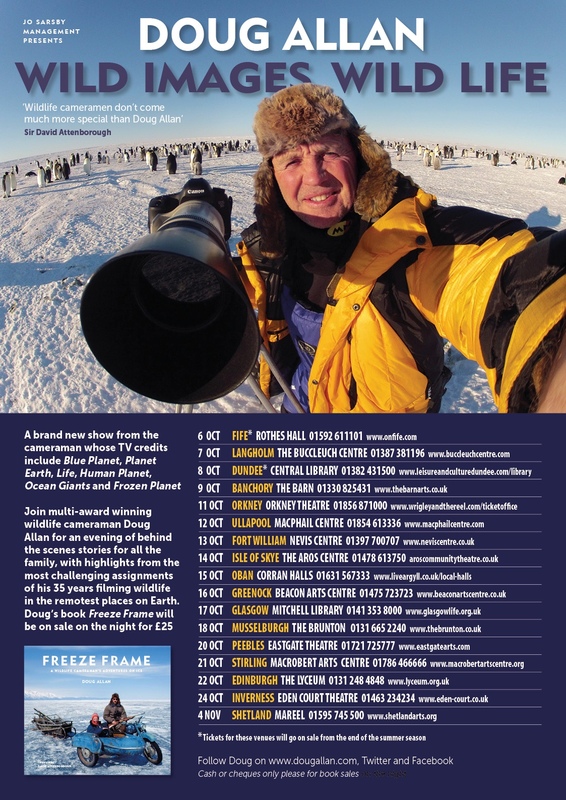 Braving the elements and depths of the Antarctic and Arctic Oceans, Doug has produced a fascinating 240 page book filled with exceptional photographs and secrets of life behind the lens, giving you a peek into the often hostile yet inspiring world of a wildlife cameraman. This book is so much more than a collection of superb images. Doug started life as a research diver in 1976 at Signy Island, Antarctica. Now with 35 years of experience in the Antarctic and Arctic, the stories that accompany every picture in this book tell of Doug’s astonishing adventures and encounters, his insights and emotions, his deep understanding of the biology of the animals and the psychology of film-makers. Born in 1951 in Scotland, he graduated with an honours degree in marine biology from Stirling University in 1973. On completion of his degree, he decided that science at the sharp end wasn’t quite where he sought to be. Underwater anywhere became the drive and for the next three years he worked on a wide range of diving jobs. He searched for (and found) freshwater pearls in the rivers of Scotland. Commercial diving in Germany involved underwater video work and rebuilding canals. Twice he assisted with research on marine biological expeditions with Cambridge University in the Red Sea. And in the summer 1975 he ran the Bouley Bay Underwater Centre in Jersey in the Channel Islands. But the big break was in 1976 when he first went to the Antarctic to work as a research diver on the British Antarctic Survey station at Signy Island in the South Orkneys. The job entailed helping the scientists to carry out their underwater studies, from boats in the summer, beneath the ice in the winter. It was the start of an affair with ice that lasts to this day. Over the next ten years until 1985, Doug and B.A.S. had a great relationship – he spent four winters and nine summers “down south” in that time, and was awarded the Fuchs Medal, then the Polar Medal, for his work. He did three winters at Signy as diver, and one at Halley Station down at 75° S as Base Commander. Halley was no place for a biologist – but it offered a chance to winter with Emperor Penguins, and a first opportunity for Doug to turn over with a movie camera rather than just stills. The BBC took first option on buying that Emperor footage for their forthcoming series Birds for All Seasons, and Doug’s career took a new direction. Using his experience of ice diving, and intimate knowledge of Signy through its winters, he proposed two films to Survival Anglia then in 1987 spent ten months in the Antarctic making them. Since then, he has returned frequently to both the poles, with a string of high profile award winning films and series for the major TV networks worldwide. In contributing to The Blue Planet, Planet Earth, Life, Human Planet, Frozen Planet, Expedition Iceberg, Forces of Nature and many other programmes he has made over 100 filming trips, including orcas attacking gray whales off California, polar bears trying to capture belugas in a frozen hole in Arctic Canada, and killer whales washing seals off ice floes in Antarctica – all on screen firsts. But he likes the challenge of filming people as well as animals, and has done documentary synch shooting for many programmes, including assignments with Discovery along the length of the Andes, to the deserts of Africa and to the upper reaches of Mount Everest. In 2011 he filmed and was a presenter for the BBC series Ocean Giants about whales worldwide. In 2012 he was one of the presenters on Operation Iceberg, as well as filming many of the sequences in this award winning series. In Wildlife Cameramen at Work from BBC Scotland in 2012, Doug was one of the featured cameramen. Doug has also contributed to numerous radio shows. His audio diary recordings while he made his “Wildlife Special – Polar Bear” became an acclaimed radio programme in their own right. He has contributed to Radio 4's Fragile Planet, Penguin Post Office. and Natural Histories. Over the years, he’s also written numerous articles about wildlife and his experiences, and two commissioned children’s books. 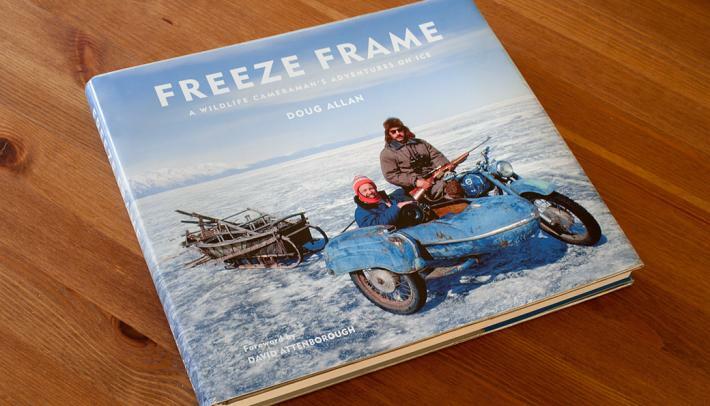 In February 2012 he published his own book Freeze Frame, a collection of polar pictures and experiences. It's available through this website. Doug lives in Bristol and through his company Tartan Dragon Ltd, he films for broadcast and for his stock library. Doug is an award winning stills photographer as well as being a film maker. He's been giving talks for many years on wildlife, diving, his experiences while film making, the craft of nature photography and the issues that the natural world is currently facing. The talks below give you an idea of the scope of his presentations, though he's happy to customise these so they're suitable for any audience of any age. All are lavishly illustrated with slides that he's taken during his travels. Each talk normally lasts 1 hour to 90 minutes, fees are negotiable. Doug takes his audience to the two frozen polar worlds - the Arctic and the Antarctic. Glorious pictures of the wildlife, polar bears, penguins and all the seals, the scenery and the people, with insights into how Doug prepares and copes with the short term of a six week film shoot at minus 30°C in search of polar bears. And quite different thoughts on survival of another kind during his two and a half year stint as a biologist on a British Antarctic Survey's scientific research station. What’s happening with climate change and how is that affecting the polar regions? Experience life on a coral reef in the Red Sea and Indonesia, under the ice with seals in Canada, and looking or belugas and narwhal with the Inuit at the ice edge. Nose to nose with mating Right Whales in Patagonia gives you a chance to rewarm before heading to Antarctica to discover the remarkable rich undersea life there. The show features behind the scenes stories and sequences from many of the best know BBC wildlife series. Adventures, encounters and insights from the cameraman whose TV credits include Blue Planet, Planet Earth, Life, Human Planet, Ocean Giants and Frozen Planet.In this show Doug takes you up close and personal with the animals that live in the wildest places on earth. Stories and pictures that will appeal to all ages. Doug has filmed whales from Antarctica, through the tropics, to under the Arctic pack ice in the far north. The keys to successfully filming them are thorough research, skilled boat handlers, a special patience, and even a healthy dose of luck. Doug describes his most memorable moments in the company of giants. All work is copyright Doug Allan unless otherwise stated. Images and text must not be reproduced without express permission.